The Cyamudongo-Project and Group Scolaire Nkungu held an event to celebrate the International Day of Forests with its focus on “Forests and Education”. The school director opened the event, which was also attended by the Chief Warden of Nyungwe National Park, the Head Ranger of Cyamudongo forest and the Executive Secretary of Nkungu Sector. The dance and singing group of the school performed inspiring songs about the protection of forests. One of the messages shared was that for each tree removed two trees should be planted. Moreover, members of the Environmental Club performed an engaging theater play about the International Forest Day and the importance of raising awareness of the benefits of natural forests. 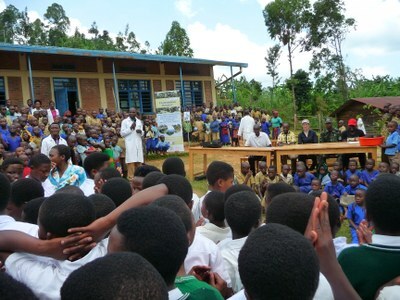 After the performance, the Chief Warden addressed the pupils pointing out the importance of Cyamudongo forest for the water cycle and the prevention of soil erosion. Afterwards, about 400 trees were planted on the school grounds with members of the Environmental Club. 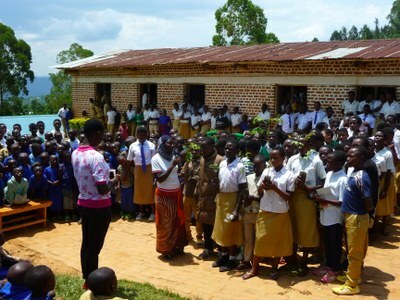 The Cyamudongo-Project also organized a drawing competition. In addition to the members of the Environmental Club of Group Scolaire Nkungu, pupils from Group Scolaire Nyamubembe and Group Scolaire Gatare were asked to make drawings to show why and how forests are important to them and their community. The best entries from each class will be selected and the winners will be invited to a tour to Cyamudongo forest guided by Cyamudongo-Project. Further information on the International Day of Forests can be found here. The director of Group Scolaire Nkungu opens the event celebrating the International Day of Forests. The pupils specify various benefits of forests such as the supply of oxygen and the purification of water. 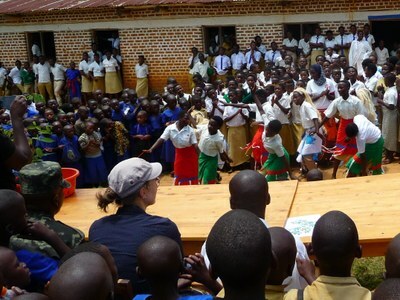 Songs, dances and a theater play performed by the pupils provide for a lively event. 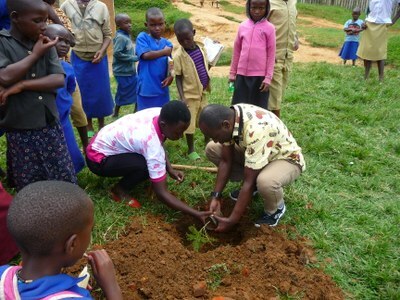 The Chief Warden of Nyungwe National Park and one of the pupils plant a tree together on the school grounds. 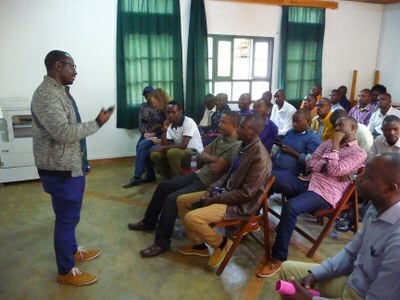 The meeting was held by the Tree Seed Unit of the Rwanda Water and Forestry Authority (RWFA) in Kigali with the funding institutions and stakeholders of the National Tree Seed Center, which has the mission of centralizing the supply of tree seeds. Siegmar Seidel, the managing project director of the Cyamudongo-Project gave a presentation on the aim and target of the project in fostering the National Forest Policy and in strengthening the efforts in increasing the diversity of tree species in Rwanda by building capacities in sustainable management at the National Tree Seed Centre and its affiliated institutions. Further information about this event in Rwanda can be found here and here. During the first day of the study tour, a short presentation of the project and an introduction to the biodiversity of Cyamudongo forest and the relationship between agroforestry and soil conservation was given. This was followed by an animated discussion on a variety of topics, such as the way in which the project activities are implemented and the level of acceptance of the project by the local population. The following day, the students first visited Cyamudongo forest, where they were introduced to different plant species. Afterwards, the group visited one of the project’s tree nurseries and learned more about the various steps involved in the production of tree seedlings from the tree nursery manager. During the last day of the study tour, the students discussed various questions in small groups such as on how to increase the awareness and the self-responsibility for nature conservation. Subsequently, the major points and conclusions were presented to the whole group and productive discussions ensued. The students were very interested and asked many questions about the plant diversity of Cyamudongo forest. 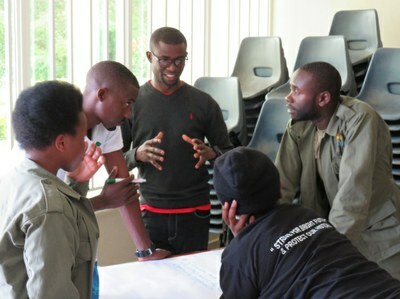 During group work the students had the opportunity to exchange their views on conservation related topics. 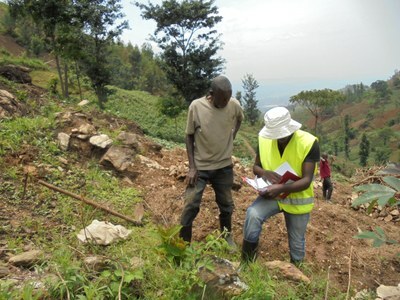 After working intensively for two years on creating an agroforestry buffer zone around Cyamudongo forest, a second study tour/workshop at Cyamudongo forest was organised for representatives of the two main partners, the Rwanda Water and Forest Authority (RWFA) and the Rwanda Development Board (RDB). After a short introductory presentation on the progress of the project, further questions were discussed, such as on the project’s experience with seed germination and the survival rate of the seedlings in the field as well as the farmers’ perception of agroforestry practices. 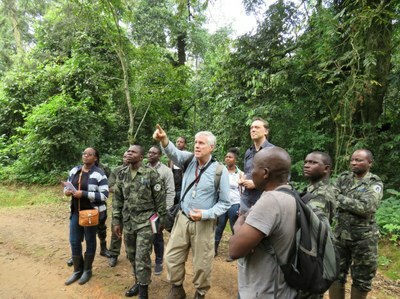 During a field visit, Professor Fischer gave an introduction to the biodiversity of Cyamudongo forest. Moreover, the participants visited one of the project’s planting sites, where they learned more about how the selection of planting sites, the trainings of farmers and the planting of trees are organised. 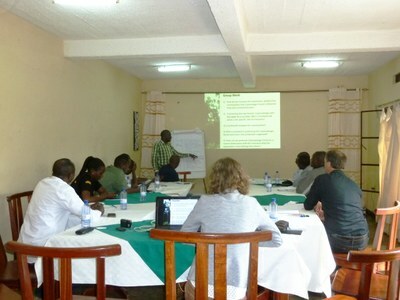 During a debriefing session moderated by the managing project director Siegmar Seidel, topics such as the cooperation with local authorities, the long-term sustainability of the project, the seed productions of indigenous trees, as well as the management of the buffer zone of Cyamudongo forest were discussed. Professor Fischer, botanist from the University of Koblenz-Landau, shared his knowledge on the plant diversity of Cyamudongo with the participants of the field trip. 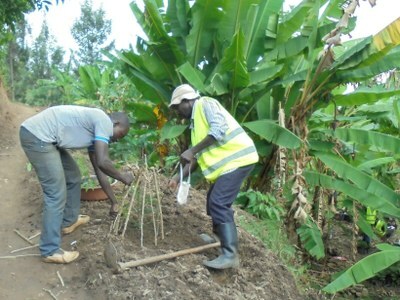 The participants had the chance to join a farmers’ training on agroforestry techniques conducted by the project agronomists. The project organised a field trip for representatives of local authorities of the project region at village, cell, sector and district level. 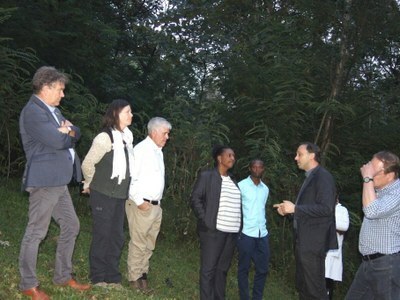 The agroforestry research plots of the University of Koblenz-Landau, the National Tree Seed Centre and the Arboretum in Butare/Huye were visited. The aim of the study trip was to deepen the understanding of the establishment and maintenance of agroforestry systems as well as their benefits and long-term effects. In addition, the study trip provided an opportunity for exchange and discussion on the implemented and upcoming activities, as well as on how to facilitate the guidance and support of farmers in the long term. The participants of the field trip visited the 30-year-old agroforestry system in Butare/Huye where the goals of the project could be vividly conveyed. The field trip also provided for ample occasions for the exchange of ideas and experiences amongst the participants. 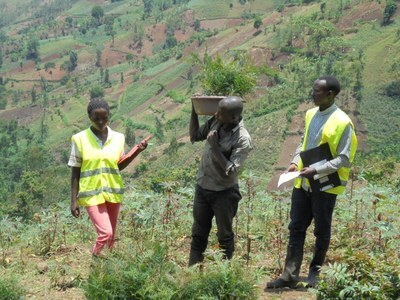 The launch of third tree planting season of the Cyamudongo project was joined by the Permanent Secretary of the Ministry of Lands and Forestry, the Director of the Tree Planting Unit of Rwanda Water and Forestry Authority and the Mayor of Rusizi District. 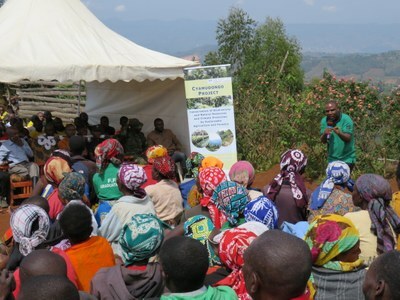 The ceremony was attended by farmers who receive tree seedlings to plant on their fields and have been trained by the project in agroforestry, tree planting and tree maintenance. The Permanent Secretary of the Ministry of Lands and Forestry emphasized the importance of the close cooperation between the project and the local population to conserve Cyamudongo forest. Further information about this event in Rwanda can be found on the page of the Ministry of Lands and Forestry and in the local news. Mr Jean Claude Musabyimana, permanent secretary of MINILAF, addresses the local residents. 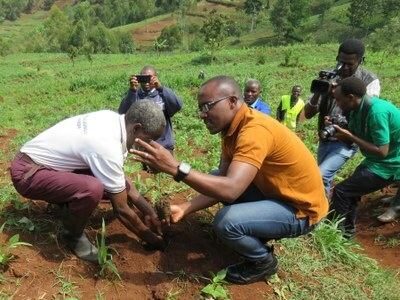 The mayor of Rusizi districts and a local farmer plant a tree seedling together. After the activities in the field, the delegation met at the field station of the project for further discussions. The stakeholder meeting took place in Higiro cell office in Nyamasheke district. After a short presentation of the project, an introduction on the topic of landscape connectivity was given. Subsequently, the characteristics of the proposed agroforestry corridor as well as alternative corridor routes were discussed. The route with less eucalyptus plantations in the corridor's perimeter, a larger distance to residential sites and a shorter total length was favored by the participants of the meeting. It was pointed out that it is crucial that the local community develops ownership to ensure the sustainability of the corridor. 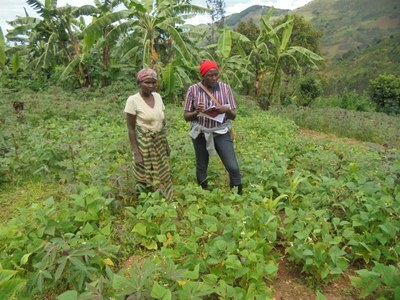 The approach of the project to involve the local population has proved successful so far, as demonstrated by the high level of interest and participation of farmers in project activities in Rusizi district. Representatives of the general public, of Nyungwe National Park and authorities at district and sector level joined the discussions on the characteristics and the route of the planned agroforestry corridor. The participants of the meeting are looking forward to the implementation of the activities leading to the establishment of the agroforestry corridor. Farmers participating in the project activities were interviewed and their fields visited by the project staff for evaluation purposes. The young trees planted during the planting season in autumn 2017 have already grown to a considerable size. 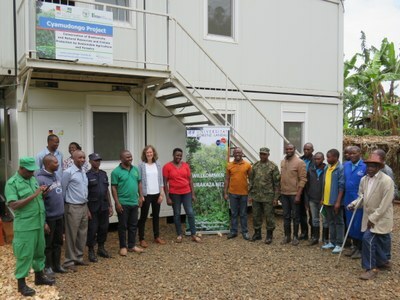 A delegation headed by the Rhineland-Palatinate Minister for the Environment, Ulrike Höfken, and the Rwandan Minister of Environment, Dr. Vincent Biruta, visited the field office of the project and Cyamudongo forest with the aim to learn more about the project, its activities and achievements. After a presentation of the project by the director of the project, Mr. Siegmar Seidel, a visit to one of the project’s tree nurseries took place. Furthermore, in the area of Gaseke cell/Nyakabuye sector some planting sites were visited where agroforestry systems were established during the planting season in autumn 2017. 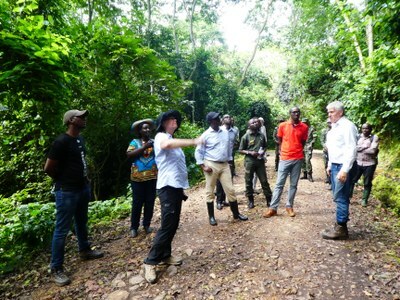 Thereafter, an excursion to the forest took place during which Prof. Fischer of the University Koblenz-Landau presented some characteristic and unique plant species of Cyamudongo forest. Further information about the delegation visit can be found in the local news. The delegation visited one of the tree nurseries run by the project to see where the tree seedlings are produced. After visiting the tree nursery the delegation headed to the farmers' fields, where agroforestry systems were established during the planting season autumn 2017. A field trip to the Cyamudongo forest with its unique biodiversity completed the visit by the delegation. 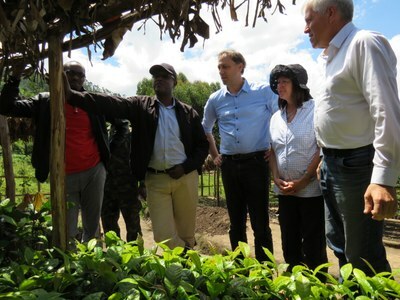 Minister Francine Tumushime and her counterpart Minister Ulrike Höfken from Rhineland-Palatinate visited the agroforestry experimental plots of the University of Koblenz-Landau at Ruhande/Butare, Huye. The experimental plots were established to investigate how soil erosion can be reduced effectively. 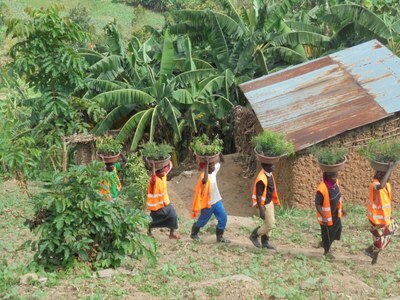 The results of two decades of research provide the basis for the agroforestry projects implemented by the University of Koblenz-Landau in Rwanda. Also the tree seed center and arboretum of Ruhande were toured. The aim was to discuss the provision of high quality tree propagation material. 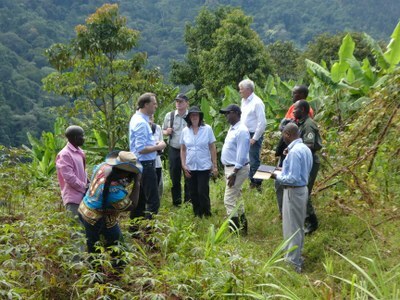 Delegation visit to the agroforestry experimental plots of the University Koblenz-Landau in Rwanda. 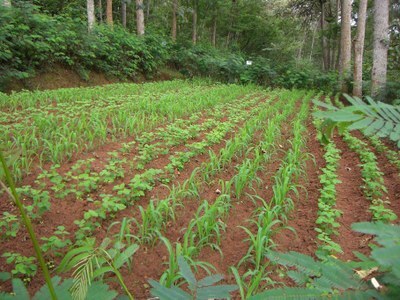 The agroforestry experimental plots exemplify the integration of agriculture and forestry to establish sustainable land-use systems. 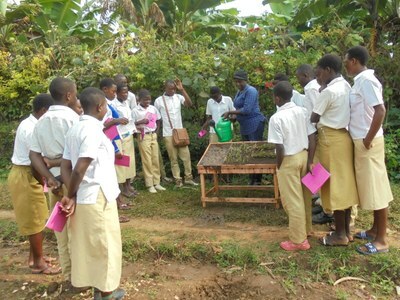 After a short introduction to the Cyamudongo project, tree seedlings were planted together with pupils on the school grounds of Group Scolaire Albert Le Grand Gatare and Groupe Scolaire Nyamubembe. 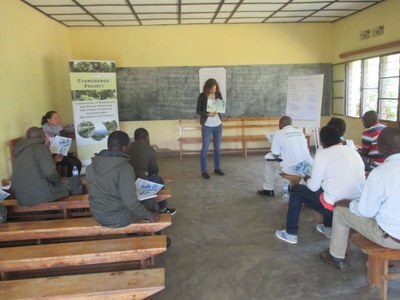 The pupils were previously taught by project staff about the importance of forests and the interrelation between agriculture, erosion and agroforestry. The lessons have been well received by pupils and teachers alike. Since pupils are important additional multipliers of the project idea, further schools will be included in the project activities during the duration of the project. 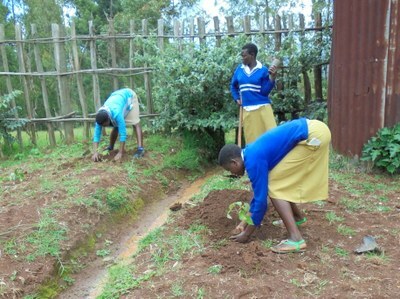 Pupils participate in the planting of tree saplings on their school grounds. The vivid demonstrations during the school lessons left lasting impressions. The first trees that the project has grown in its tree nurseries were planted on 28.09.2017 in Gaseke cell/Nyakabuye sector. Further trees will be planted troughtout the rainy season. In preparation of the project's first planting season, the project team was engaged in a wide array of activities. Tree nurseries were constructed, tree saplings were produced in ample quantities, village meetings were held to inform local residents about the upcoming project activities and trainings were conducted on agroforestry related topics for interested farmers. 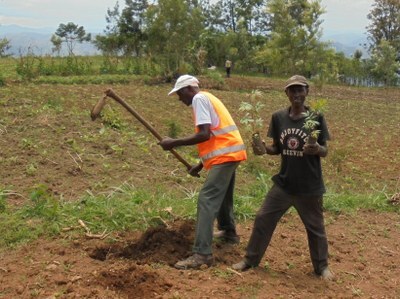 From now until 2021, the project is planting trees during both biannual rainy seasons to establish sustainable agroforestry systems together with local farmers to contribute to the conservation and protection of Cyamudongo forest. The project agronomists visit the fields of the farmers and advise the land owners on-site regarding the selection of the tree saplings. Assistants transport the tree saplings from the tree nursery to the plant distribution point and thus ensure a continuous supply for planting. Farmers receive the seedlings at the plant distribution point. Interns are responsible for record taking during the planting activities. 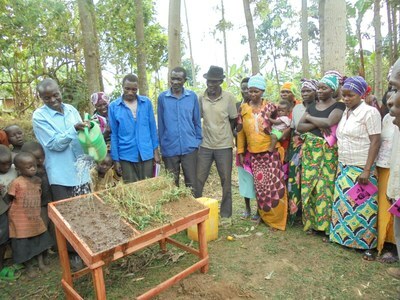 The farmers receive support by trained planting assistants in the establishment of their agroforestry systems. The knowledge and skills acquired during the farmers' training for the protection and care of the young trees are put into practice. 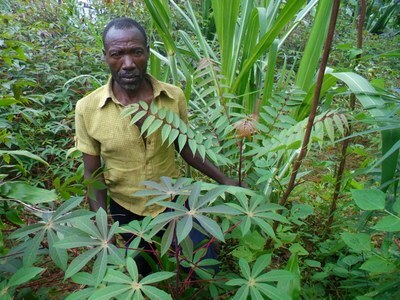 A farmer proudly presents the tree saplings he has just received for his field. 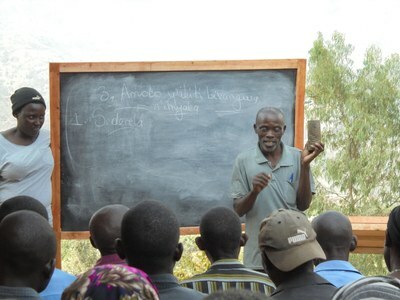 Between August and September trainings were offered for interested farmers on the subject of agroforestry. The first training unit covered the topics soil erosion, agroforestry land-use systems and the properties of agroforestry tree species. The second training unit included more specifically details on tree and hedgerow planting and maintenance as well a compost preparation. Participation in both training units offered by the project is a prerequisite for receiving tree saplings in the coming planting season. Through the training, the project promotes knowledge about agroforestry species, guarantees the correct planting and aftercare of the young trees and increases the acceptance for local tree species. 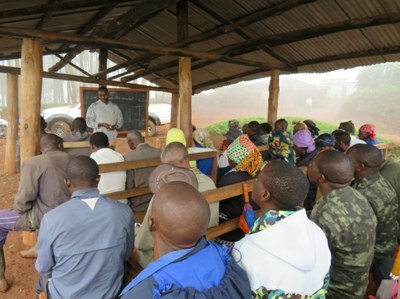 More than 1.200 local farmers who own land in the surroundings of Cyamudongo forest were trained during the first round of trainings. The project aims to train more than 9.000 farmers until 2021. The topic of soil erosion is introduced using an experimental setup that illustrates the problem in a comprehensible way. During the farmers' trainings, the participants have the opportunity to share their knowledge about agroforestry tree species. 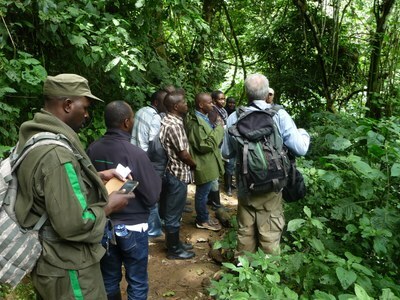 Staff of the Rwanda Development Board (RDB), the Rwanda Water and Forestry Authority (RWFA) and the Kitabi College of Conservation and Environmental Management (KCEEM) joined a study tour to Cyamudongo forest and a concluding workshop. 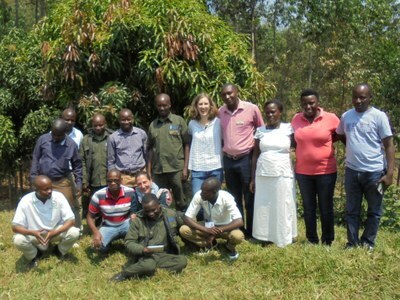 After an introduction to the project, the Cyamudongo forest was visited to learn more about its biodiversity. 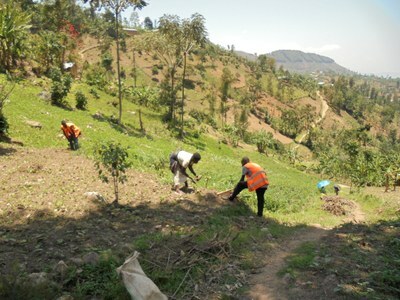 Subsequently, the plan to connect Cyamudongo and Nyungwe forests through an agroforestry corridor was discussed and the planning process initiated. During group work, ideas on how to raise awareness of the conservation status of Cyamudongo forest in the local community were reviewed. 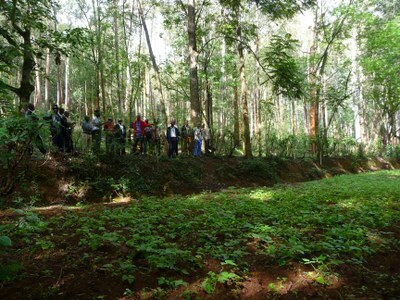 The study tour offers the opportunity to learn more about the special features of Cyamudongo forest. The participants of the workshop present the results of their group work to the other attendees. 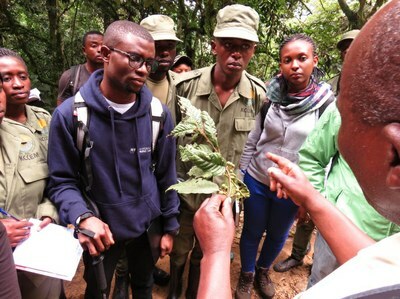 In March, rangers of Nyungwe National Park participated in training units offered by the Cyamudongo project on Phytodiversity, Zoodiversity and Methods of rapid biodiversity assessment and disturbances. Each training unit lasted three to four days and was attented by ten participants. The active learning experience, which resulted from the integration of theory and practice, was appreciated by the participants. The trainings will be repeated throughout the duration of the project with the aim of improving the identification and monitoring skills of the participants by conveying a sound knowledge of key characteristics of plant and animal taxa as well as of a variety of monitoring parameters such as indicator species and species richness. 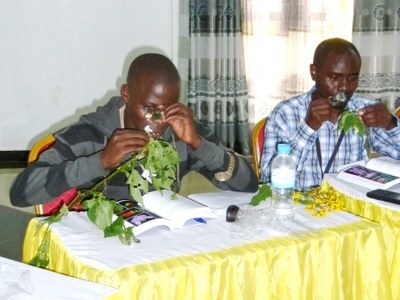 The participants learn about key features such as leaf arrangement and floral symmetry, which are crucial for plant identification. During a nocturnal field trip the participants have the opportunity to observe amphibians in their natural habitat. 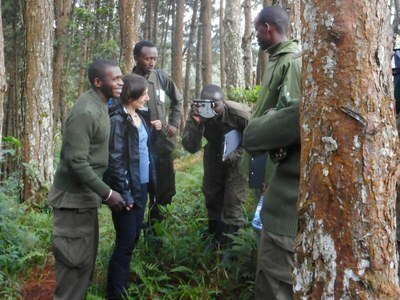 Through hands-on activities, the participants learn about the monitoring of environmental change in forest ecosystems.